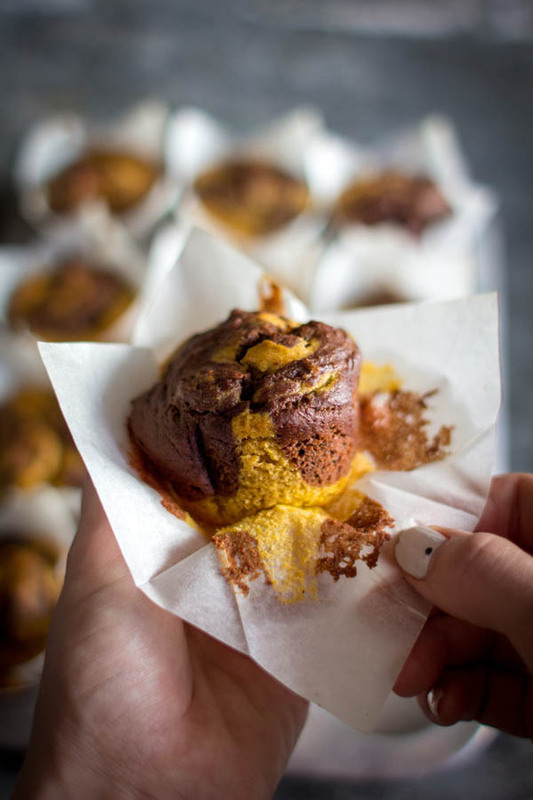 If I had to pick just one decadent baked good to crank out of my kitchen all autumn long these Marbled Pumpkin Muffins would be the one! They are totally decadent, with a tender crumb and are chock-full of dark chocolate. Pretty perfect right!? Today the internet is exploding with pumpkin goodness thanks to Cake Over Steak & Twigg Studio's #virtualpumpkinparty and since these muffins are my family's favorite pumpkin creation to come out of my kitchen this season they just had to be my contribution to the celebration! Kash literally counts these Marbled Pumpkin Muffins when they come out of the oven and makes the rest of us answer for every single one that goes missing from the pan. It's a bit ridiculous, but I honestly can't remember seeing him this passionate about any type of food in his entire life. I guess the boys taste buds are finally waking up! Hallelujah! You should totally join the #virtualpumpkinparty because there is some pretty serious pumpkin recipe inspiration happening over there. The lovely ladies of Cake Over Steak and Twigg Studios have you covered on their sites with a full list of pumpkin loaded links! Hop on over, say hello and get your Pinterest trigger finger ready, trust me, you are going to need it! Preheat oven to 350° F. Line a muffin pan with liners, set aside. In a large bowl, whisk together the flours, cornstarch, pumpkin pie spice, baking powder, baking soda, and salt; set aside. In a medium bowl whisk together the eggs and sugar. Add the melted butter, buttermilk, vanilla and pumpkin, whisk to combine. Add the wet ingredients to the dry ingredients and whisk just until no lumps remain. Divide the batter in half. Then add the melted chocolate and cocoa powder to half of the batter; stir to combine. 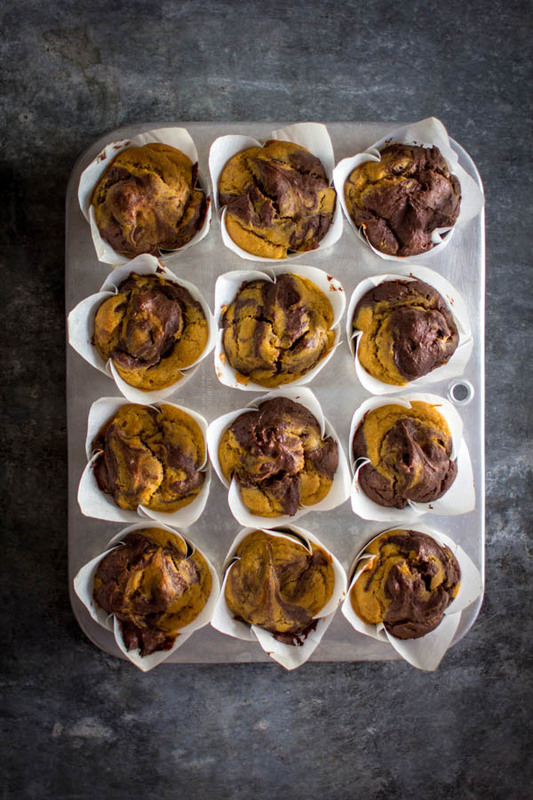 Use 2 small ice cream scoops or spoons to make layers of batter in the muffin cups alternating between pumpkin and chocolate. Use a table knife to swirl through the batter in a figure 8 pattern. Bake for 30 minutes until a toothpick inserted near the center comes out clean. Remove and cool in the pan for 5 minutes. Transfer to a wire rack and cool completely. The post Marbled Pumpkin Muffins was first shown on Beard and Bonnet.